If you’ve been marvelling at the breathtaking images of marine life on Blue Planet 2, you’ll also have witnessed the heartbreaking scene where a pilot whale calf dies from plastic poisoning, and other scenes showing the devastating extent and effect of plastic pollution in our oceans. And, coupled with China’s recent decision to halt the import of plastic waste for recycling, it’s never been more important for all of us to do our bit for the planet by reducing the amount of plastic we use. While we won’t be able to eliminate waste completely, if we all endeavour to make at least one change, it can have a significant impact over time. We’re not perfect either – one of the most common complaints we get is about the amount of packaging we use in our parcels, but we are always looking at ways to reduce it. Have a look below at some ideas for how to reduce your own plastic footprint. How many times have you got to the supermarket only to find you’ve left your plastic bags at home? If you’re anything like us, you’ll have an ever-growing mountain of them stockpiled in a cupboard at home and it’s all too easy to forget to put them in your car before leaving the house. Many African countries, including Kenya, have already banned the single-use plastic bag because of the environmental havoc they wreak, and if we all make an effort to use fewer (or better still, none), or remember to take the ones we already have, the better it will be for the planet. Our 2-in-1 reusable trolley tote set are an ingenious idea. 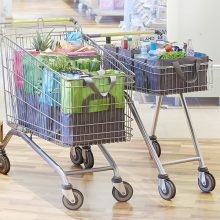 Specially designed to fit inside large or small supermarket trolleys, the colour-coded interior makes it easy to organise your shopping, so it’s quicker and easier to unpack when you get home. They’re an extendable bag which makes them perfect for when you only have a few bits to get or are feeding the extended family. And you’ll find plenty of other ways to ditch the plastic bag on our website, no matter how big or small your shop. We’re probably all guilty of buying bottled water, but many of those bottles end up in our seas and rivers doing untold damage. In the UK we get through over 35 million plastic bottles every year, many of which won’t end up being recycled. An easy way to reduce that number is by carrying a reusable drinks bottle with you when you’re out and about – it will save you money, too. From bottles with built-in infusers you can add fruity flavour to, to bottles that track how much you’re drinking, you’re sure to find something to suit in our range. Another simple way to cut the amount of plastic you use is to stop buying plastic straws or straws that can’t be used again. Instead, use eco-friendly metal straws, or these fun reusable Dino Straws which are great for children’s drinks. Avoiding pre-packed-in-plastic vegetables is another way to play your part. 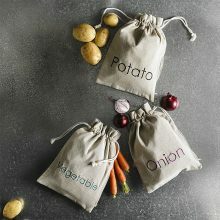 Buy your produce loose and keep your food fresher for longer in our vegetable preserving bags. Don’t buy pre-packaged fruit like bananas or lemons either – they have their own perfectly adequate natural packaging. But if you do want keep your bananas from overripening and going to waste, keep them in a Banana Bag. And half-used citrus fruits and other produce can be kept safe for another day in one of our food savers. With talk of a latte levy in the news, your takeaway coffee may be about to get more expensive to try and discourage the use of disposable coffee cups, most of which will end up in landfill. Get yourself a reusable coffee cup and ask your barista to decant your coffee into it. Or, even better, make your own at home and keep it warm in a flask or travel mug. You can even compost your coffee grounds afterwards. Coffee pods have long had the reputation of not being recyclable, but Nespresso now offer various ways to recycle their pods. And new companies like Halo supply completely compostable coffee pods. We’re all used to putting out the recycling for collection nowadays, but there are plenty of things you can do to make the process even easier. Our handy Household Waste Recycling Bags are a great way to organise your waste ready for collection. 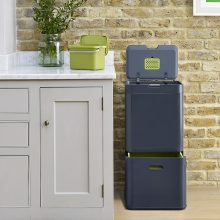 And for something more sturdy and attractive, recycling bins such as the Joseph Joseph Intelligent Waste System should satisfy even the most style-conscious environmentalist. Teabags, eggshells, leftovers and other food scraps needn’t end up in the bin either. Invest in a countertop compost bin to collect them all up, ready for transporting to the compost heap. And when it comes to those notorious fatbergs we often read about in the papers, don’t add to the problem by tipping your cooking oil or fat down the sink, use our Absorb Bins for a quick and easy way to dispose of it. We started with the sea, so let’s end there, too. For every Brabantia Newicon bin bought, a donation is generated for Plastic Whale, a Dutch-based organisation that fishes discarded plastic out of our rivers, canals, and seas, and turns it into boats which are then used to fish out more plastic to make more boats to fish out more plastic to make more boats to fish out more plastic… you get the picture.